Urban apartments deserve modern slim TV stands that are designed for smaller spaces. Living rooms are being compressed and saving 10+ inches in depth on your TV stand is an easy choice when you consider most TVs are ultra slim as well as modern set top boxes and components like Apple TV. The difference between a cozy living room and uncomfortable living room can be the extra space taken up by bulky furniture in your modern space. If you have to dance to navigate through the passage way between your TV and your coffee table the furniture you have is wrong. If your space is tight, having a slim TV stand with the right size coffee table makes your space feel right and ultimately frustration free. Have a look at this example image where a small living room space is made to work even with a large sofa and regular size coffee table when utilizing a thin TV stand. It used to be that a “TV stand” was actually a huge entertainment center. These bulky cabinets completed enveloped the television, and they included shelves and cabinets on both sides of the TV and under it to store DVD players, game systems, speaker systems, and all kinds of DVDs, CDs and other media. As technology has advanced, such huge entertainment centers are no longer necessary. Few people still own a DVD player. Instead, they have game systems or streaming devices that allow them access to digital media and content. With the modern trend to digital you don’t need a large cabinet for DVD collections but only small storage bins for game controllers and small items. TVs have also gotten smaller and so have electronics yet even recent modern TV stands are quite deep and have not kept with the electronics trend. Many people now have a flat-screen TV that either hangs on the wall and you certainly do not want a large media/electronic adding bulk after going to all that work to hang your flat screen. Go slim for your storage needs! By investing in a slim TV stand, you can save space in your living room and create a stylish display whether its wall mounted or if it holds the TV also. View some ultra slim TV stands here! A nice bonus to the having a modular system is that it can be customized at a later date. If you feel you need to raise the height of it or perhaps build it larger if you upgrade your TV you have that choice. You can even build it into another completely different piece of furniture by using its parts and combining it with other kits. The system includes all the pieces you need, such as walls, backs, sides, and connecting joints. By changing the way you snap these pieces together, you can change the shape and functionality of the unit. When you order, you get the pieces to create a specific design, but you can easily customize the unit by changing up the way the pieces are put together. If you want to get really creative, you can order several stands to get more pieces and create more interesting shapes. 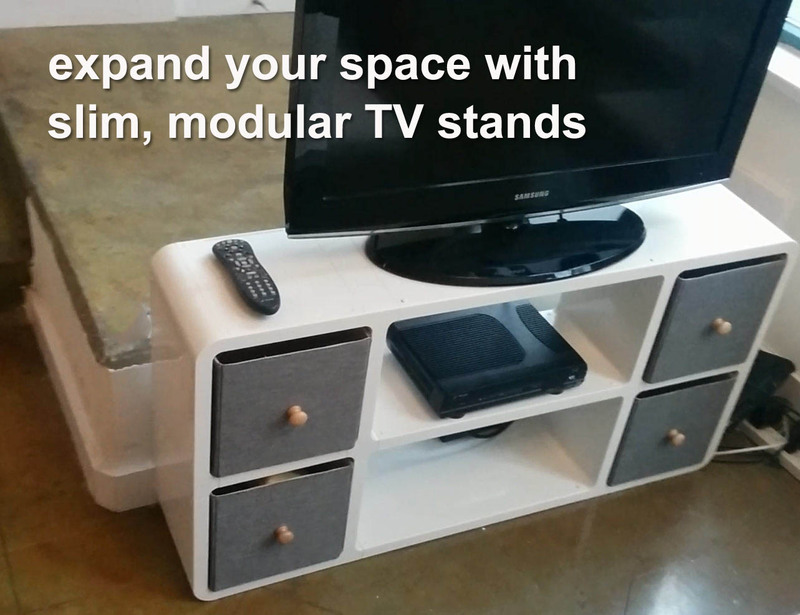 For example, you can create a slim TV stand that looks like Tetris blocks stacked together or a stand that is shaped like a cat. The only limit is your imagination and the amount of space and pieces you have. The TV stands at Expand Furniture have a modern style that will fit in with any contemporary decor scheme. Space saving TV stands like the Slimline TV Stand 1 or Slimline TV Stand 6 feature smooth edges and straight lines with no distracting molding or engraving. The stands come in either black or white, and you can place storage bins of just about any color in the cubes. The surface of these stands is smooth and easy to clean. Traditional TV stands are made of stained wood that can be easily scratched or damaged by water and other elements. Not only does the wood look a little outdated for contemporary homes, but it also requires a lot of upkeep. 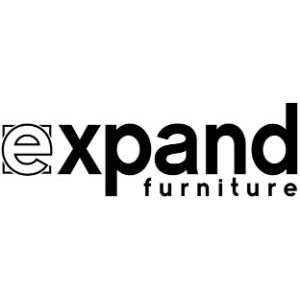 The TV stands at Expand Furniture are made of more durable and easy-to-clean materials. Perhaps the most important benefit of the TV stands that Expand Furniture offers is that they help to save space in your home. 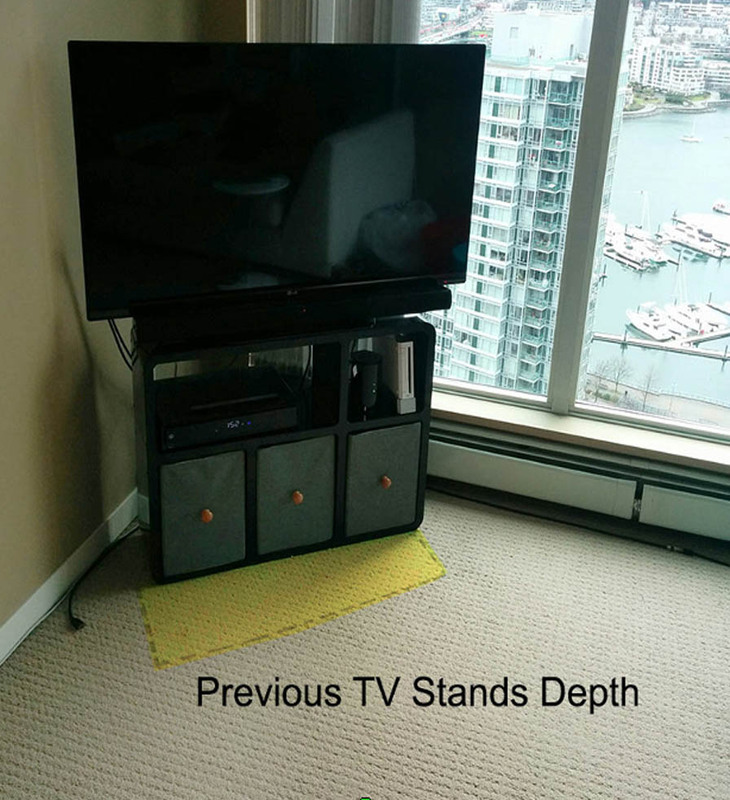 In the photo example we can see the previous depth of the former TV stand. In this situation about 8 inches of depth was saved allowing the TV to be pushed back further against the wall adding not only 8 inches of space but more importantly blocking less light from the windows. The TV is at an angle in the corner and the larger and deeper previous stand pushed the TV out and blocked off too much room. 8 inches may not seem like a lot but it’s noticeable in a tight space, specially when you are trying to preserve your light and view. 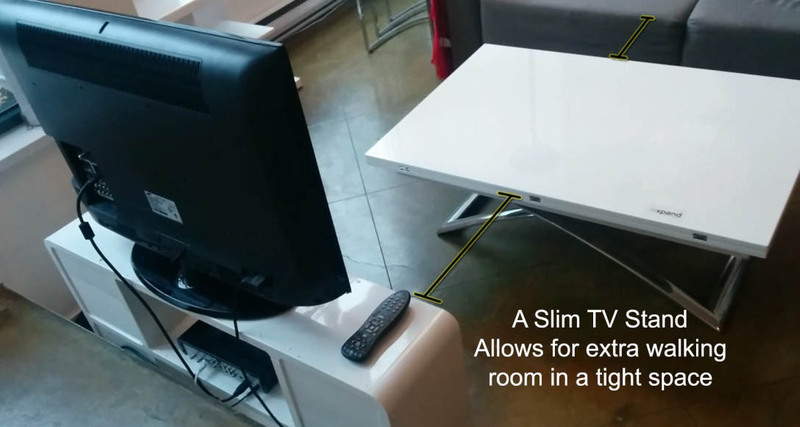 These TV stands take up no more room than the width of the TV itself. The depth of the stand isn’t much bigger either — just over 9 inches. These slim stands provide just enough room to hold the TV and a few other essentials without projecting too far into your living room and taking up too much floor space. These stands are ideal if you have a small or cramped living room or even for a minimalist who realizes they don’t want a bulky stand for their thin TV! By investing in a space saving TV stand, you give yourself just the storage room you need for your most important items. You can store USB cables, video games, controllers, DVDs or toys and other gadgets in the bins. Who’s to say that you have to use your TV stand just for your TV? 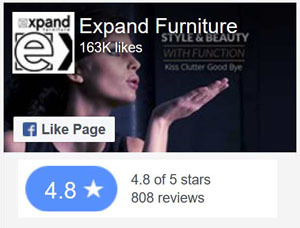 The models from Expand Furniture can serve a number of other purposes. For example, you can place the Slimline TV Stand 1 in your entryway to place mail, shoes, purses, and other personal effects that you need to pick up or put down as you are coming and going. You can also use this stand or the #6 model in a child’s room to help keep toys organized. The stand could also be useful in craft rooms, offices, kitchens, and more. You could even turn it into a personal vanity. You can use the TV stands as they are designed for these other purposes, or you could change the shape to suit your need. The flexible snap-together construction makes it easy to make changes. For example, you could take the middle shelf out of the Slimline TV Stand 1 to turn the unit into a small desk or vanity. Whatever purpose you choose for the stand, it will continue to offer you the same space saving and other benefits. 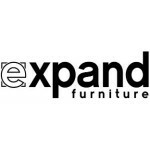 Whether you need a slim TV stand or other space saving options, Expand Furniture has the right furniture to meet your needs. Our extensive catalog includes transforming dining tables, accent and side tables, hidden beds, folding chairs, loft systems, and modular bookcases and wall shelving systems. All our furniture is designed to help you maximize the space in your home while also creating stylish decor. 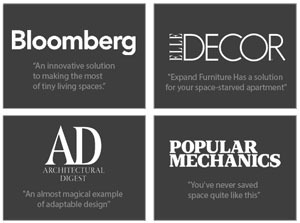 Expand Furniture features a myriad of stylish and functional furniture pieces. To learn more contact us today.